Everyone and their aunt knows that the HTC Sensation is destined to play nice on T-Mobile’s 4G waves, but no one really quite knows when the Android 2.3 Gingerbread smartphone will come out to play, so to keep you happy a couple of images of the HTC Sensation have made it into the wild, which might mean the handset could possible release sooner than later. The pictures of the HTC Sensation come via Android Community and by way of Tmonews, and that apparently the retail packaging looks to be complete and they even have a shot of the HTC Sensation box. 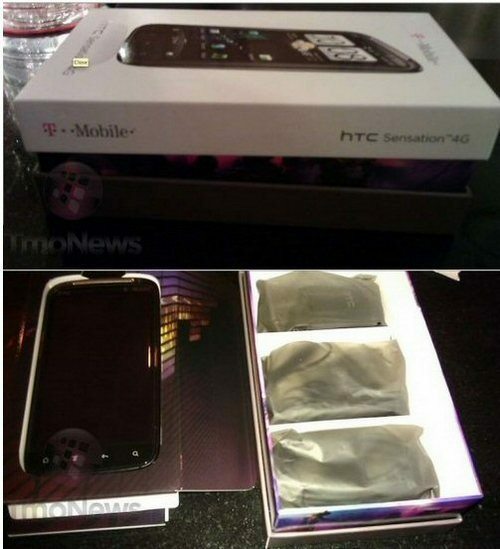 Going by the picture of what is located inside the packaging, it would appear that the bundle for the North American HTC Sensation would be the same as for the European version of the Android handset. The HTC Sensation is rumoured to make an appearance on US shores with T-Mobile on the 8th of June, but no confirmation on that release day so it could well show up before, anyway for those interested in the HTC Sensation check out the pictures for now and more over at Tmonews.